I've started a game with 1.16 patch and I've just realized that in the unit detail panel you can't see (like in 1.15 patch) the blockade value for each unit. I think it's very useful, for example, when you want to buy ships for blockade and you need to know which one has the highest blockade value. Could you re-add this feature to the unit detail panel, please? 1.16 uses a new method for the detail window, and so this item was omitted. No fix anytime soon, but be patient! OK, thank you for your quick reply, Lodi. And I thought I understood blockading . Don't all combat vessels have the same value (1) for blockading? And land units none? Not all vessels have the same blockade value. Likewise, not all vessels have the same patrol or evasion value. The best for blockading are the blockade squadrons and frigates. They have the highest blockade value. By the way, lands units have no effect on blockading. 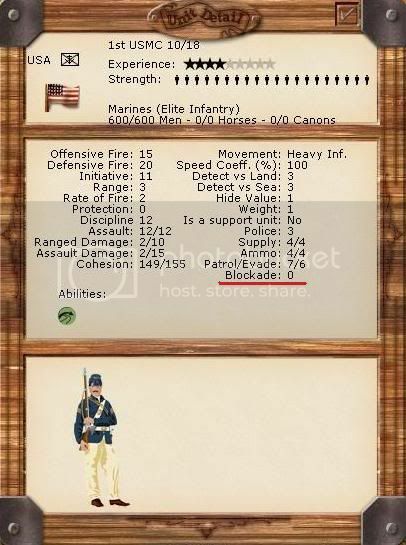 In fact, in 1.15 patch you could see the blockade value in the unit detail panel. It was very helpful to prepare the appropriate ships for blockading. With respect to the ships, send to the shipping box all transports that you can and protect them with warships, frigates especially, because they have a high value of detection and evasion. Frigates (light, steam, and armored) can be used to pursue raider ships in the shipping box; however, they can also be used to intercept blockade runners in the blockade boxes. Light Frigates have the highest Blockade rating, and are most effective at raising the blockade %. Add some ships in the blockade boxes first, then to blockade the biggest confederate ports. This will add up. Light (not Steam or Armored) Frigates and blockade ships are the most effective ship types. Okay, your talking specifically about Blue-Water Blockading as opposed to Brown-Water Blockading; I was thinking of the latter. I've never actually looked into the Blockade Values of each type of ship since as the Union I'd learned that Blockade Flotillas (Blockade Squadrons) have the highest ROI (Return On Investment). French and English ships have the same values except that their Brigs have a Blockade Value of 3 instead of 2. They also have a class of ship they simply call 'Warships' which appear to be Ships-of-the-Line. These have Blockade Value 3 and are something like very large steam frigates. The US laid down a number of these type of ships, but only a few were actually built and still on hand during the CW. Their value as fighting ships had long since wained but their size made them useful as receiving and auxiliary ships. As far as I know the Blockade Value plays no role in Brown-Water Blockading since I've only ever seen the actual number of ships/boats being counted and not their Blockade Value. I've used Blockade Squadrons for Brown-Water Blockading, but not seen that they actually function any differently than the same number of gunboats. If the Blockade Value of a ships is what is counted for determining the Blue-Water Blockade Value vs the CSA's trade, then the Blockade Ship is by far the best ship for this as it's Blockade Value us twice that if a Sail-Frigate. The Sail-Frigate does have the best detection value though which makes is idea for raiding or defending against Raiders. I like to put a number of frigates into the shipping fleets to help them avoid and defend against Raiders. That's right, I was talking mainly about Blue-Water Blockading. Captain_Orso wrote: As far as I know the Blockade Value plays no role in Brown-Water Blockading since I've only ever seen the actual number of ships/boats being counted and not their Blockade Value. I've used Blockade Squadrons for Brown-Water Blockading, but not seen that they actually function any differently than the same number of gunboats. I totally agree with you. There is no difference. It turns out that some code was "house-cleaned" and the DataIndex for blockade removed. No current plan exists to further upgrade the AACW engine, so sadly this fix won't be made. Does this mean that all ships are equal for blocking duty? FelixZ wrote: Does this mean that all ships are equal for blocking duty? oop! Sorry I missed this question! No, the ships still have different Blockade values, as described by Capt Orso in post #6 here. The variable removed is only used to 'port' values to the 'FrontEnd' part of the game engine for display. Hey, I hadn't seen this thread had been "refloated". Thank you very much anyway, Lodi. lodilefty wrote: The variable removed is only used to 'port' values to the 'FrontEnd' part of the game engine for display.